A man accused of opening fire on campers and drivers in the Malibu State Park Area was charged Monday with murder in the fatal shooting of a 35-year-old father killed while he slept next to his daughters at a campground. Authorities said this week they had finally assembled enough evidence to link the June 22 killing of the young father to the arrest of a reputed serial burglar, caught last October in a steep, brush-covered ravine near the park while armed with a rifle. A criminal complaint filed Monday in Los Angeles County Superior Court charges Anthony Rauda with the murder of Tristan Beaudette, who was hit with a single shot while his young daughters slept beside him. Rauda, 42, also faces a total of 10 counts of attempted murder for a series of other peculiar gunfire attacks in the area of the park and Las Virgenes Road, and five counts of second-degree burglary for break-ins in the same area over the last few years. In a statement, the Los Angeles County District Attorney's office said Rauda is accused of shootings in the Malibu Creek State Park area that date to November 2016, when he allegedly wounded a man sleeping in a hammock at the park. Rauda is accused of shooting into vehicles three different times in 2017. In June 2018, he allegedly opened fire on a Tesla on Las Virgenes Road. Beaudette was shot four days later. 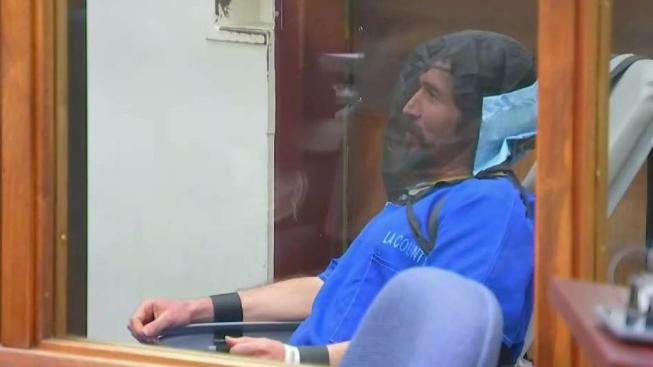 Prosecutors were only able to file the case after a forensic comparison of bullets linked several shootings, including the Beaudette murder, with the gun Rauda was allegedly carrying when he was arrested. That ballistic comparison was completed in early October, but the case took many more weeks to assemble, according to the sources. They also said evidence shows Rauda is also responsible for additional shootings and burglaries for which not enough evidence was found for prosecution, including an until-now unsolved shooting of a woman driving on Thousand Oaks Boulevard in Ventura County in 2010. Rauda has been tied to thefts and violence in LA, Ventura and Sonoma counties. "It's a 10-year crime spree that could make a Hollywood movie," said one detective familiar with the case who was not authorized to speak publicly about the investigation. Rauda has been serving a sentence in LA County jail for violating the terms of Post Release Conviction Supervision, or PRCS, as a result of his arrest in October in the Malibu burglaries. That sentence was expected to be satisfied in the next week, according to court and jail records. Detectives from the LA County Sheriff's Department's Major Crimes Bureau caught Rauda Oct. 10 near the park. Rauda was carrying the gun and two loaded magazines, according to testimony at a recent PRCS violation hearing. A key break in the Malibu Creek State Park death investigation came less than two weeks before that when a security camera system recorded images of a man wearing a headlamp and "tactical style" clothing during an office break-in. As the figure in the video moved into view it was clear the man had a rifle slung over his left shoulder. Some of the images, not shown publicly, captured detailed views of the gun. Detectives compared the security video with firearms catalog photos and soon confirmed the gun carried by the burglar was a 9mm carbine, a weapon capable of firing the same caliber bullet that killed Beaudette.